“The unedited images… explicitly demonstrate the rabbits’ suffering,” the One Voice group wrote in its appeal. A FRENCH ANIMAL rights group has demanded a ban on raising angora rabbits for their prized fur, releasing a secretly recorded video during which the animals squeal while being shorn. The rabbits “cry in pain and fear whilst their fur is pulled off, sometimes with the skin too”. “It’s unacceptable,” One Voice’s president Muriel Arnal told AFP, calling for a ban on angora “as long as this farming is not regulated”. One Voice, created in 1995 and based in the eastern city of Strasbourg, “infiltrated” six angora rabbit farms around France for the investigation, which was conducted from February through July, she said. The group would not identify the companies, preferring to “denounce an overall system and achieve a ban on raising and selling angora,” Arnal added. 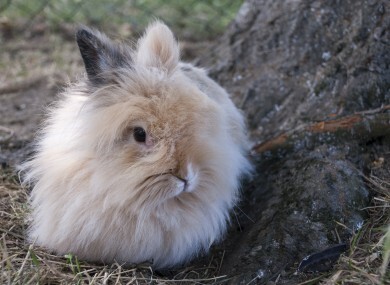 The US-based animal rights group People for the Ethical Treatment of Animals (PETA) launched a campaign in 2013 denouncing the treatment of angora rabbits raised for their fur. Some 90% of world production of angora wool comes from rabbits in China, which lacks animal protection laws. As a result of PETA’s drive, major clothing retailers including H&M ceased using angora in their products. “Compared with China, the only thing that is different in France is that the rabbits have straw in their cages, but that’s more to keep their fur silky and clean than for their well-being,” Arnal said. “The operation is a source of permanent stress for the rabbits,” One Voice’s website says. Naked after the ‘harvesting’, they risk exposure to thermal shock when put back in their hutches without any real protection from the cold. A campaign by another French group, L214, against animal cruelty in slaughterhouses prompted the agriculture ministry in March to order nationwide inspections. L214 also released videos secretly recorded in three abattoirs, including footage of sheep being bled while still showing signs of consciousness and a lamb being butchered alive. The group named the abattoirs, which were shut down. Email “Animal rights group releases secret video footage of rabbits to call for angora ban”. Feedback on “Animal rights group releases secret video footage of rabbits to call for angora ban”.